5 Things About Popes And Their Names; Like, Why Do They Change Them? : The Two-Way One name has been "retired." Others have never been reused. John is the most popular. It's a tradition going back to the year 533 that a new pope chooses a name other than the one he was born with. He's likely sending a message about what type of leader he hopes to be. The man chosen to be the next pope will choose a new name — one other than what he was born with. So, Cardinal Joseph Ratzinger became Pope Benedict XVI. His predecessor, Pope John Paul II, was born Karol Jozef Wojtyla. And so on back through history. 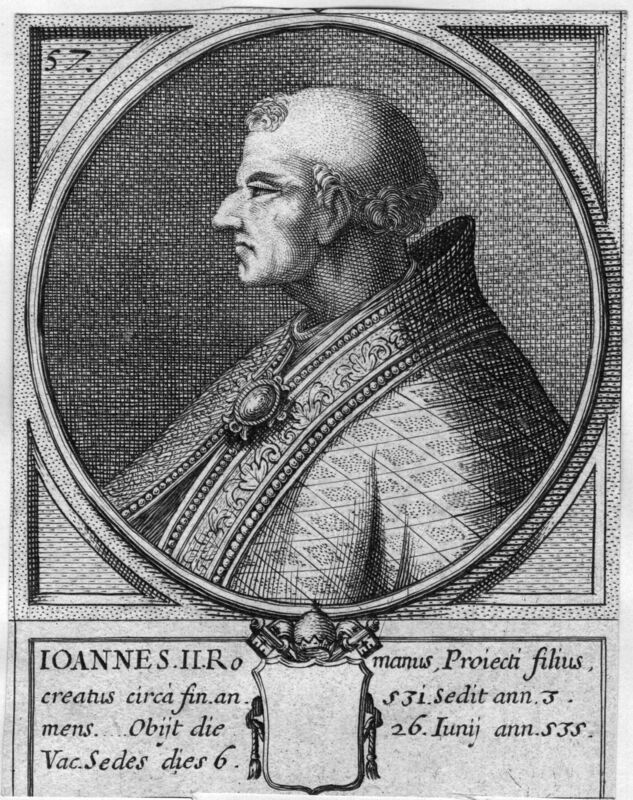 Pope John II, whose name at birth was Mercurius. When he became pope in 533 he changed his name — starting a tradition that continues. How far back? That's one of the 5 things we'll try to explain. 1. Who started this tradition? The Kansas City Star reports in a story headlined "What's In A Name? A Lot If You're A Pope," that it apparently began with "Mercurius, named for the god Mercury," who in 533 changed his name to John II. "A pope named after a pagan god — that wasn't going to go over, PR-wise," Biagio Mazza, a church educator and historian in Kansas City, tells the Star. John II set a precedent: Almost all popes since have chosen a name that honors a saint or a previous pope (or both). Many are thought to have been sending some sort of message. Pope John Paul I, as CTV News reports, chose "a composite of the names of two previous popes, John and Paul, who had guided the church through the tumultuous Second Vatican Council (known as Vatican II) in the 1960s. Many consider it to be one of the most important — and controversial — periods in the church's history, as leaders attempted to modernize relations between the church and the secular world." The new (and short-lived) pope "wanted to show he was not going to deviate from their path and would be faithful to what they had done," William Portier, chair of Catholic theology at the University of Dayton, tells CTV. 2. When did a pope last choose not to change his name? That's a bit of a judgment call. The Clerical Whispers blog writes that "the last pope to use his baptismal name was Marcellus II in 1555." As the 2008 book Popes and the Tale of Their Names notes, "his birth name was Marcello Cervini degli Spannochi." So, Marcellus was really just a variation of Marcello. 3. Whose name has been "retired." St. Peter was the first pope and there hasn't been a Pope Peter since. He has "a unique and sacrosanct standing as a pope," as Popes and the Tale of Their Names puts it, and his followers have not wished to look as if they're comparing themselves to him. 4. Which name has been the most popular? John is the leader and may never be topped. Pope John XXIII, who died in 1963, was the most recent (if you include the two John Pauls, of course, you could argue that there have been 25). Tied at No. 2: Benedict and Gregory. Those names have each been used 16 (XVI) times. 5. What Names Are Still Waiting To Be Reused? St. Linus was the second pope, and there hasn't been another Linus since, as NewAdvent.org's list shows. And there are many others from the church's first 350 years or so that haven't seen their names reused — including St. Hyginus, St. Zephyrinus and St. Dionysius. But Pope Lando (913-14) deserves a special mention. He appears to be the last pope with a name that was completely unique (though John Paul I also deserves a nod because he decided to add the "I" himself; no other pope, it seems, has declared himself to be a "first"). Since Lando's short time leading the church, of which not much is known, there hasn't been another Pope Lando. Before we finish, we'll say this before someone else does: Lando does have one semi-famous namesake, of course, from the Star Wars movies. The Irish online betting site Paddy Power does give odds on what name the next pope will choose. Right now, Leo is the 11/10 favorite. There have been 13 other Leos, so far.